“… floral teas envelop the drinker in the sweet scent of flower perfume from the first whiff to the last lingering finish on the palate. Flowery oolongs, on the other hand, are more like the flowers themselves rather than the perfume and aroma. Well yes, they do exhibit both perfume and aroma, but they go somewhat beyond that. Little flower oolong. Photo courtesy of Bingley’s Teas Limited. Recently I received samples of two lovely teas from Bingley’s Teas, and reviewed the first of these in January. This is the second of the two teas — a flowery pouchong with the lovely and very appropriate name of Little Flower Oolong. Steeped up gongfu style with water at string-of-pearls temperature, this tea gives forth the aroma of a spring garden: honeysuckle, daffodil, and a brief whiff of lilac. Carried into the cup, it is quite like sipping a spring bouquet, with a blend of sweet flowers and spices, along with a hint of warm almond cookies — you know, the kind you get at a Chinese restaurant. Complex, yet at the same time palate-friendly. I preferred the results when, in later steepings, I slightly reduced the amount of the beautifully rolled leaf from the quantity I used in the first steeping. 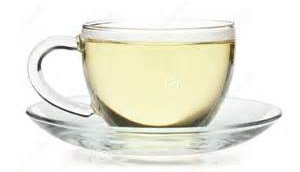 This is probably a matter of individual taste; it’s a gentle tea and I enjoyed it more when I treated it gently. Less leaf seemed to elicit more of the almond cookie quality in relation to the flowery qualities. 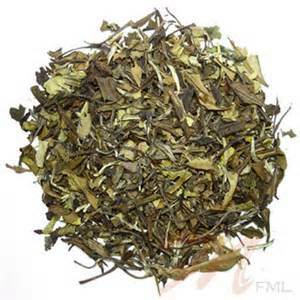 Leaves can be re-infused at least four or five times, with subsequent infusions eliciting less “cookie” and more flowers. Spring will be here (finally!) in a few weeks. 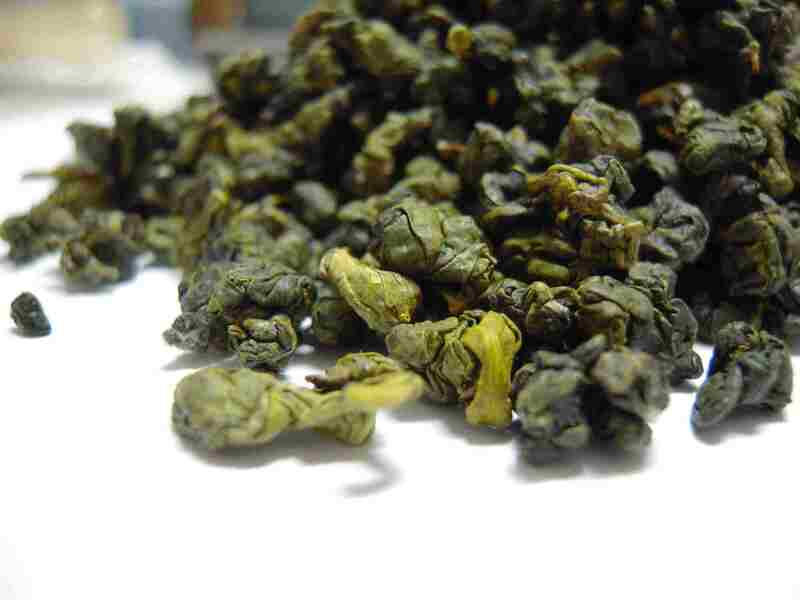 Little Flower Oolong, IMNSHO, would be an ideal tea for ushering in the new season. Or any season. Often when I talk with tea drinkers about my favourite teas, they tell me that they don’t drink oolong or white teas because these teas are too difficult to prepare. So instead they stick to “easy” teas: black teas. Black teas are easy? Are you serious? After green teas, black teas are the touchiest and most persnickety of all the teas. Some of them are downright pains in the you-know-what to get right. Why is that? Well, if your water isn’t hot enough, like at a rolling boil, most black teas end up tasting flat. And you have to time them really accurately. Too short a steep and there’s no taste. Let them steep just a touch too long and you’ll end up with a bitter, undrinkable cup. Compare that with oolongs and whites, the easiest of all the teas to prepare and the most forgiving when you get it wrong. Yes, you read that right! Granted that oolong teas perform best when steeped gongfu style in a clay teapot, and I like to steep white teas in a gaiwan. You can, however, infuse both oolongs and whites in a gaiwan, gongfu style, or in a standard English-style teapot. Certainly some black teas are that versatile, but they’re few and very far between. In English style teapots, oolongs can steep for anywhere from four to seven minutes; white teas for ten to fifteen minutes. Now that’s what I call versatility! And there will still be enough spirit in the leaves for one or two more infusions. Put a black tea into either a gaiwan or an Yixing clay teapot and you’ll end up with over-steeped swill. Not to mention that most black teas do not lend themselves to multiple steeps – one infusion and the leaves are spent. And if the water is a little too hot or too cool? No problem: the teas will still come out just fine. They’re both really very forgiving. “But white tea has no taste!” you’ll tell me. Actually it might not – not if you’re steeping it for one or two minutes, as many tea vendors advise. Try infusing for twelve minutes and you’ll be amazed at the wonderful taste and aromas you can coax out of white teas following this low-temperature/long-steep method. And no, you won’t be over-steeping them. Occasionally I get distracted and forget that I left my oolong tea to steep; when I finally do return it might be fifteen minutes or even an hour later, and while I wouldn’t recommend this as a regular practice, the tea usually smells and tastes pretty darn good. Back when I was taking night classes, I always brought along a thermos of white tea to keep me alert. There weren’t any of those nifty travel mugs with built-in infusers, so I just put leaves and water into a regular thermos. Three hours later I’d drink the tea during class break, then refill the thermos with hot water – using the same tea leaves – to steep for the ride home. And never once did the tea get bitter. It smelled and tasted sweet from the first sip to the last. Can you do that with black tea? All content Copyright 2014 JP Badarau; all rights reserved. Recently DH and I drove up to Black Mountain, North Carolina, from our home in South Carolina, to have tea at Dobra Tea. The day was grey and drizzly so it was not quite as pleasant a drive as it could have been, tho’ still scenic as only the Blue Ridge can be. 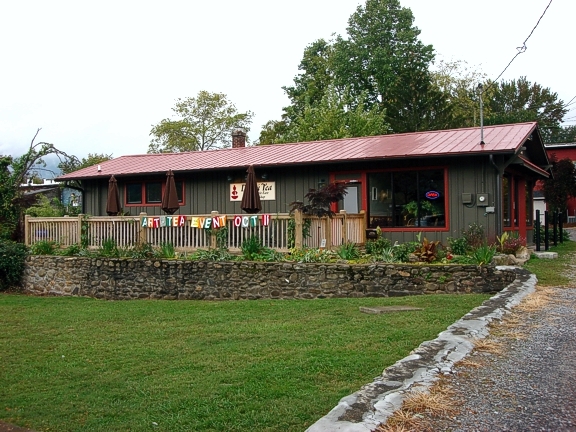 In 2005 we moved to South Carolina, and a couple of years ago I heard that a Dobra Tea House opened in Asheville, North Carolina. Hmmm, getting closer! 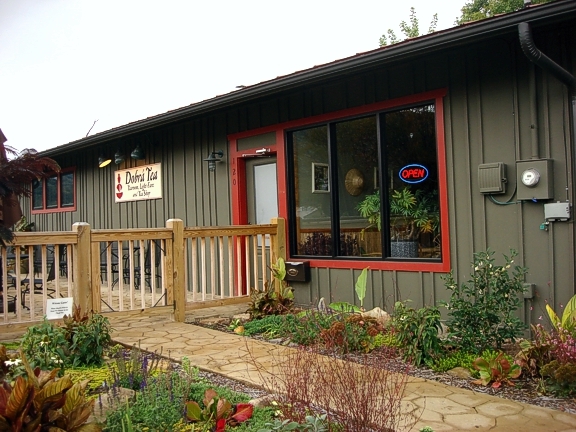 Then I heard of another Dobra opening in Black Mountain, a small town about twenty minutes from Asheville. When DH came home from work one evening and told me that he had a day off next week and was there anything special I’d like to do, I immediately said “Let’s go for tea at Dobra Tea in Black Mountain!” On days when DH doesn’t go to work — weekends, holidays, and any other days off — we spend the mornings together over several pots of tea. And we enjoyed going to tea houses in New York, Montreal, and other places we used to travel to. So off we went. Black Mountain is a charming little town with small shops and restaurants lining the main street. The tea house is set somewhat back from the other businesses. It’s a lovely wood building with a sizable terrace and a serene ambiance. 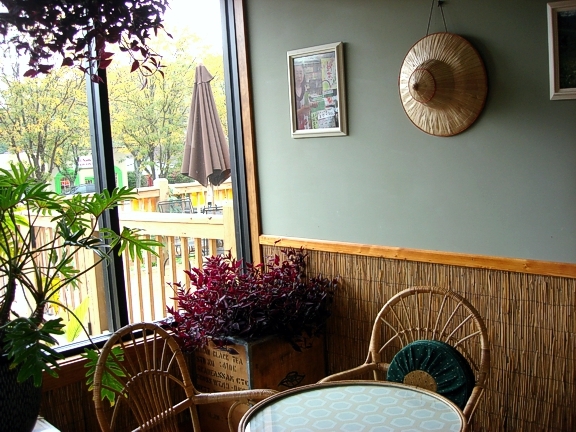 Although the day was rather dismal, inside the tea house was bright and welcoming. We walked through the front door past a variety of seating areas, of low tables with cushion seating as well as tables of standard height with chairs or benches. Little nooks off to the sides held book shelves. We picked a table in the front of the tea house where it was filled with light. We were each handed a thick binder that listed all of Dobra’s tea, tisane, and food offerings. Each beverage and dish was fully and clearly described, and most were illustrated. It took us a while to browse through the book. Our lovely hostess offered to answer any questions or make recommendations. For DH the choice was clear: he prefers black teas and has become quite fond of teas from Nepal; there was a Nepal Ilam on the menu. He ordered homemade halvah to accompany it. My starting selection was matcha, sort of like soup before the meal. The matcha was perfectly frothy and brothy, and was accompanied by daifuku — mochi filled with sweet red bean paste. The mochi was wonderful, both in texture and flavour. When we finished our first teas, DH asked for a refill of his Nepal, while I needed my usual morning oolong. After consulting with our hostess as to the most floral of their Taiwan oolongs, I decided on their Jin Xuan, which I have been favouring of late. I also ordered a serving of baba ghanouj, a dish that I adore — it’s fairly common in the NYC area tho’ rarely seen on menus here in the Southlands. The oolong tea arrived in a tiny clay teapot along with a cup and a carafe of water for additional steepings, kept hot over a tealight candle. The Jin Xuan did not disappoint; it was exactly what I wanted. The “baba ghanouj” was another story. This dish is a combination of eggplant and sesame tahini, and was so described on the menu. What arrived was more of an eggplant salad — no tahini in sight. It wasn’t bad, it just wasn’t baba ghanouj. Service was somewhat awkward: the “salad” rested in a small bowl with a small wooden paddle. As it was rather lumpy it was difficult to dish it out much less spread it on the accompanying very dry, thin crackers (not the pita bread the menu had noted) and some equally awkwardly large chunks of raw vegetables. As the whole plate was generously dusted with za’atar I decided to just do the best I could with it. Again, it wasn’t awful — but I would certainly never order it again. My oolong provided six outstanding infusions, so that kind of made up for the disappointing nosh. Most of all, I had the opportunity to enjoy morning tea time with my DH without having to fix the teas myself — not that I really mind, tho’ it is quite nice when someone else handles this important job! 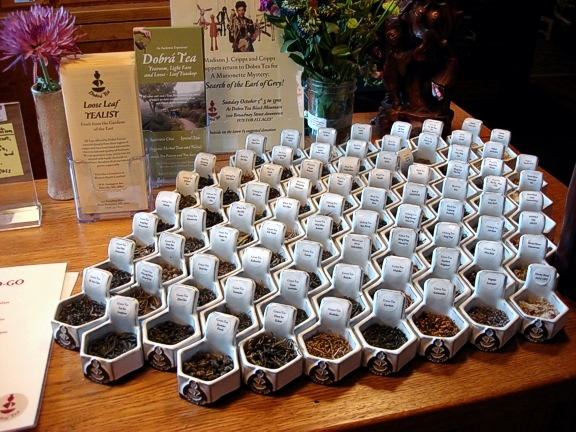 A sip of DH’s Nepal tea demonstrated that it was expertly prepared. 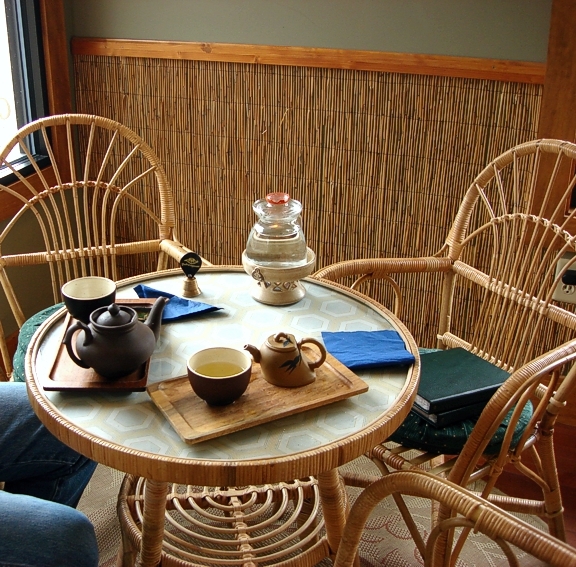 So bottom line: three excellent teas, two excellent sweets, comfortable seating and surroundings. I’d say it was a near-perfect tea. With the autumn colours now nearing their peak in the Blue Ridge area of southern North Carolina, this has no doubt become a very pretty drive, and and I’m looking forward to our next trip to Black Mountain and Dobra Tea. There’s a lovely terrace — unfortunately it was raining the day we visited. A bright and welcoming interior — the table next to ours. There are also several low tables with floor cushions. 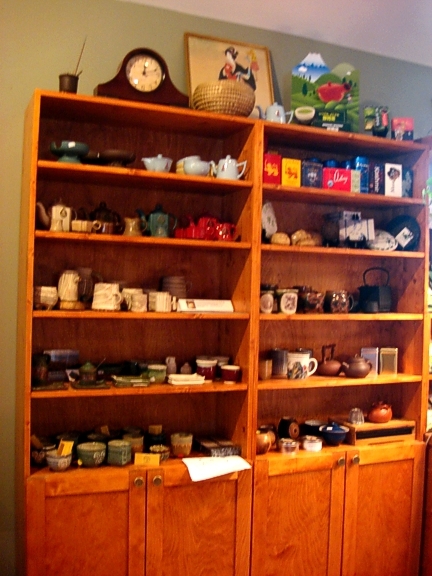 A beautiful display of mostly handmade tea ware. 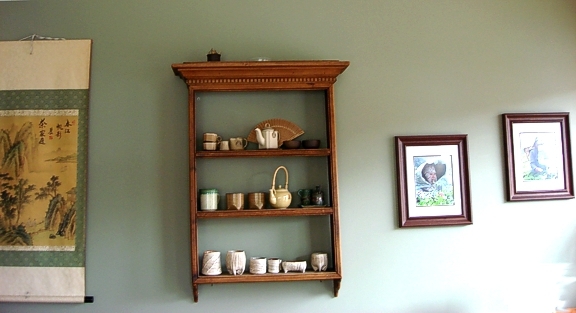 More tea ware and pretty art work on the walls. I loved these little cups with the Dobra logo displaying many of their teas and tisanes on the counter so you can see and sniff before you decide. Our table in the front window. My setting is a cup and small clay pot of Jin Xuan Taiwan oolong; the carafe with tealight candle provided water for six infusions. DH’s setting is his second pot of Nepal Ilam black tea. 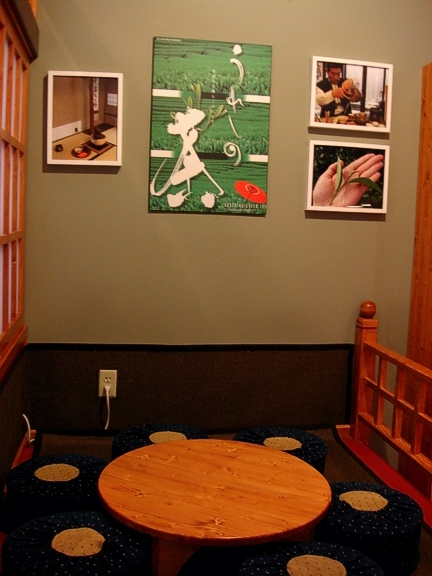 The green book on the chair on the right is the tea house menu.